Pre-Engineered Buildings are functional in several areas that vary from small car parking shelters to extensive clear span aircraft barns to low-rise multi-store buildings, Pre-Engineered steel Buildings deliver a high stability when compared to non-residential single-store buildings. 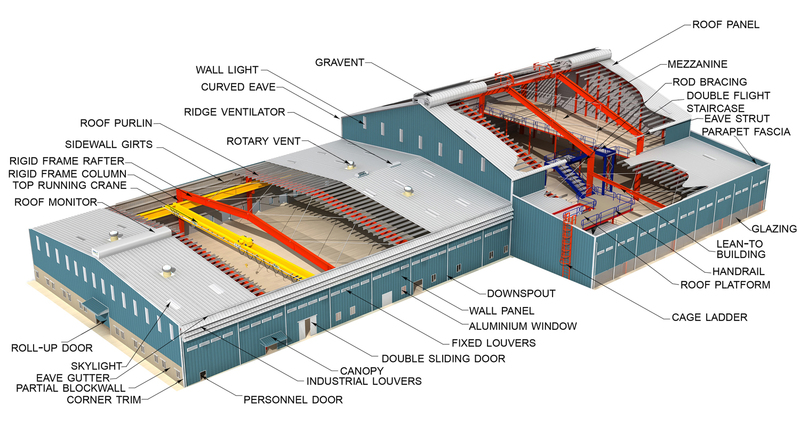 Pre-engineered buildings (PEB) are steel constructions constructed over a mechanical model of primary members, secondary members, roof and wall sheeting related to each other and numerous other building constituents. These buildings can be delivered with diverse structural and non-structural trappings such as wall lights, skylights, turbo vents, louvers, ridge ventilators, roof monitors, trusses, doors & windows, mezzanine floors, canopies, crane systems etc., centered on the client’s requirements. All the steel buildings are customly designed to be light in weight and great in strength. So, PEB have become more supple, durable and adjustable over the past four decades that has made steel one of the selected materials for constructions. PEB’s remain perfect for non-residential and wide-span low-rise constructions. The crucial advantages of PEB comprise reasonable in cost, factory organized quality, longevity, durability, flexibility in extension, environment friendly, faster installation, etc. Pre-engineered buildings are used for various applications like factories, showrooms, warehouses, supermarkets, metro stations, aircraft hangars, offices, schools, shopping malls, hospitals and many more.